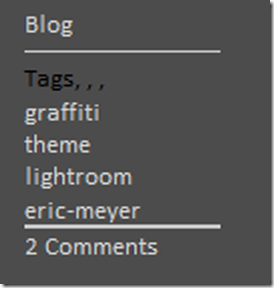 I mentioned in my previous blog post that the workaround I had for displaying the tags for a post vertically, rather than as a horizontal, comma-separated list, was flawed. As you can see, the biggest problem is that the clever CSS hackery I used means that the commas are still displayed in a line after the title, like an ellipsis with tails. At normal size this isn't really visible, but it's there nevertheless. Which is just nasty. 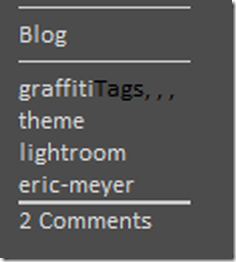 Now, I could just fiddle with the CSS again, but it's time to write a bit of C# and create a Chalk extension. The basic idea is simple: write a class with one or more methods, decorate the class with ChalkAttribute, compile, and deploy. I'll start off with the shell. Since I intend writing more "one-shot" Chalk methods, I'll arrange them all in a class called JmbChalk. From this you can see a couple of things in the boilerplate. First you must add Graffiti.Core as a reference and into the using list. It is this assembly that contains the ChalkAttribute class. I'm also adding System.Web because I'll be accessing a class there that will help me set up the url for each tag. The Chalk method is called TagList. It takes four parameters: the taglist itself, some value before each tag (for example, <li> although it doesn't have to be an HTML element tag), some value after (for me, </li>) and then the class name to apply to the <a> element. 13:   string format = string.IsNullOrEmpty(linkClass) ? 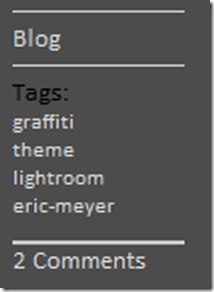 As you can see the tags folder for Graffiti is off the root and called tags (so we need to calculate the absolute path for it), and the Util.CleanForUrl method is a utility function found in Graffiti.Core. A quick compile, and then I added the JmbChalk dll to the /bin folder for the website. Once that was uploaded, I could remove the hackery from the CSS file and the tags list now renders the same across all browsers I test against (Firefox, IE7, Chrome, and Safari).